This particular song is all these at the same time: melodious, sad, uplifting, gritty/ rock. Wished I could write songs like that. Deftones is at www.deftones.com. YouTube channel, here. This Wikipedia entry covers more about their history, influences, and discography. Thanks to Rocklah! for featuring our latest music video! I appreciate that they made effort to credit the CC-licensed material properly. The music video is made up of other Creative Commons Licensed video material and is a testimony that CC-licensed music can be just as good as the typical recording industry licenses. Rocklah! is a music blog that tries to aggregate South-East Asian music news all in one site. “Lah” is also a colloquial term used by mostly Singaporeans and Malaysians to emphasize the word before it. So, “Rock Lah” is basically about all things that ROCK! Check them out at rocklah.com. Feel free to email me if you’ve further questions. RamblingLibrarian@gmail.com. The full video can downloaded at www.archive.org. “Graffiti artists – Street Art in LA“. Public Domain. I completed the song, One World, in May this year. I knew in my heart I had to make a music video for it. I finally completed the music video over five evenings last week, including a weekend. 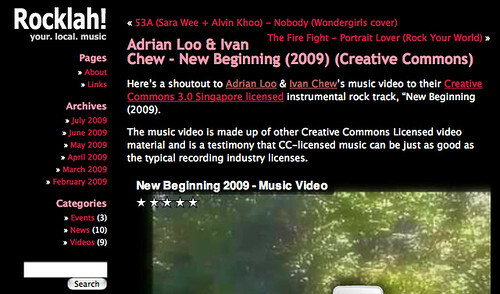 Music Video: One World (2008) by Ivan Chew is licensed under a Creative Commons Attribution 3.0 Unported License. Based on a work at starfishstories.wordpress.com. Permissions beyond the scope of this license may be available at http://StarfishStories.wordpress.com. In my mind, I saw this lone guitarist, holding a Les Paul Standard, walking up to the edge of a canyon. The camera pans around him and out into the vastness. Snap the view to the guitarist hitting the first note. And the video pans to scenes of soaring clouds, fly-overs of mountains, water falls, and then to city-scapes. And the video was about people, of all races and creeds. One World, as the song title goes. I couldn’t possibly shoot that kind of video. And I didn’t have the inclination to start anything. Until about a week ago. Went to Flickr.com and Archive.org to search for materials licensed under Creative Commons (attribution). Picked out 115 photos and 15 videos. Used most of them. It’s not 100% what I had in mind (e.g. couldn’t find that rock guitarist video footage). But it’s close enough. A huge thanks to those who’ve shared their works under the Creative Commons Attribution license. It’s their generosity–those who have shared their work under the CC license–that I could make this music video at all. Heh, just making a record of the credits took me two nights! The full-quality MPEG-4 video can be downloaded, here.